I recently traveled to Scotland at the invitation of Glen Moray, a Speyside Distillery that in 2017 celebrated its 120th year of nearly continuous operation. While visiting Scotland, I witnessed the profound connection between a place and its people, a connection that has been shaped over the course of generations, and is the deep cultural tradition of Scotch whisky production. The distilleries themselves have modernized in recent decades and require less labor than they did in years past. However, combined with the other industries that support whisky production, the Scotch industry is still an important source of jobs for people in rural Scotland. In contrast to the mysterious wildness of the Scottish highlands, Speyside is a well-ordered pastoral dreamland. With the River Spey flowing through its heart, Speyside is a region of small river valleys interspersed with lush green pastures that are home to flocks of sheep. 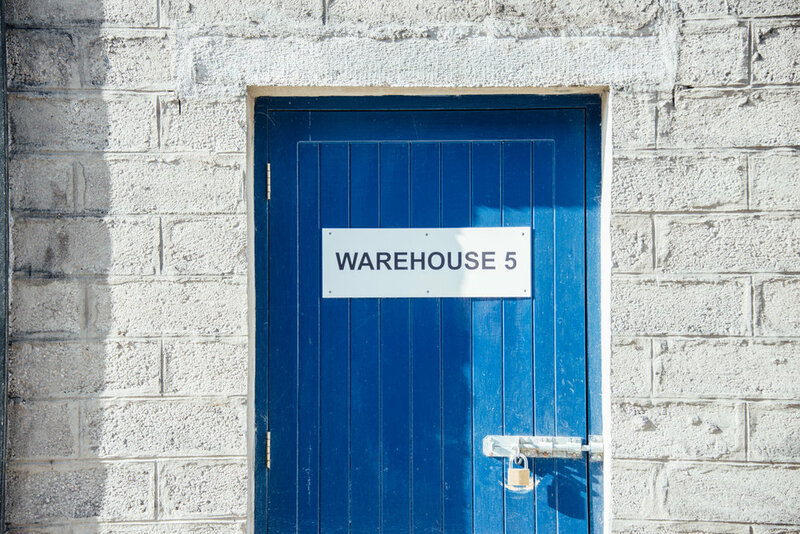 Speyside also happens to be the industrial heart of the Scotch whisky business, in no small part due to the abundance of fresh water. 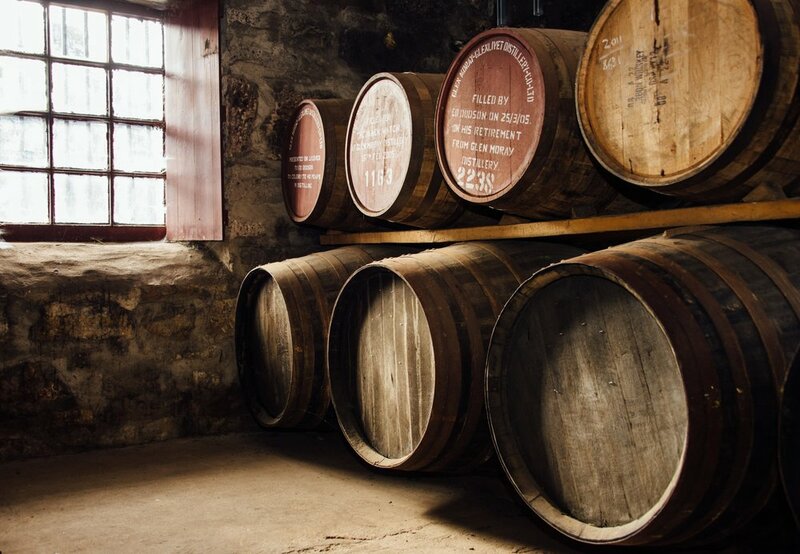 It boasts the highest concentration of distilleries in Scotland and produces around half of all Scotch by volume. Its importance to the Scottish economy is apparent in that Scotch whisky is second only to oil in its value as an export. 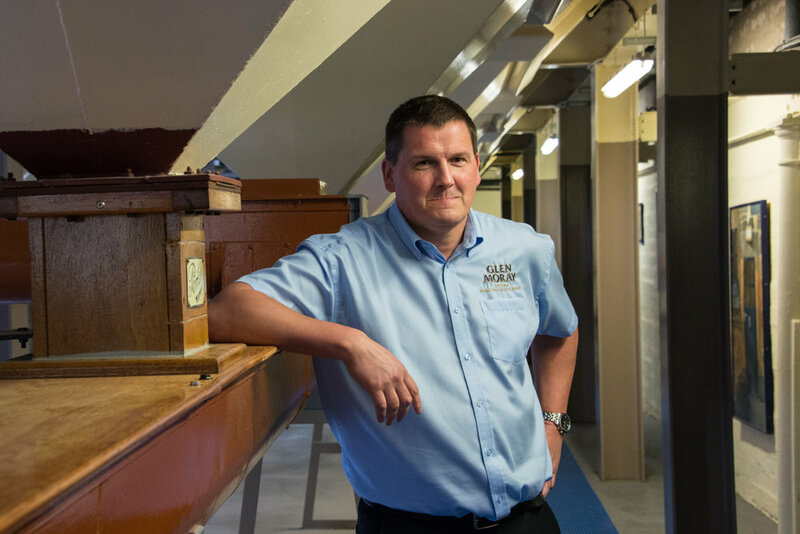 Iain Allan, who manages Glen Moray’s visitor center and promotes whisky tourism in the region, estimates that half of all Speyside distilleries exclusively sell their whisky stock for blending and are relatively unknown to consumers. Some of the most well known single malt varieties, however, are distilled in the area. Many are named after the glens, or valleys, where their distilleries lie: Glenlivet, Glenfiddich, and Glen Grant, among others. The Glen Moray Distillery straddles the River Lossie on the outskirts of the town of Elgin, which sits at the northern reaches of the Speyside region. Glen Moray is not the most well-known of Scotch whiskies, perhaps because for most of the twentieth century its best stock was blended and bottled under the Glenmorangie brand. Glenmorangie owned the Glen Moray distillery until the French spirits group La Martiniquaise purchased it in 2008. This transaction marked a dynamic shift in the Glen Moray brand, because for the first time, the master distiller had discretion over which spirits were bottled under the Glen Moray name. This shift is best told through the tenures of its two most recent master distillers, Ed Dodson and Graham Coull, both of whom were born and raised near Elgin. There is a certain romance associated with the master distiller in the world of single malt whiskey. It’s tempting to picture the master distiller as a person in a room filled with leather and mahogany, sipping and blending spirits to come up with a perfectly flavored whisky. The truth is a bit more complex. For one thing, flavor consistency in a brand’s signature spirits is often as much about the chemistry of the spirits as a particular distiller’s taste. For another, the day-to-day job of a master distiller resembles that of a factory manager, running the daily operations of the distillery. Ed Dodson, distillery manager at Glen Moray from 1987 to 2005, was the last of the brand’s master distillers under Glenmorangie. Dodson is a grandfatherly figure who bears a striking resemblance to Bilbo Baggins from Peter Jackson’s film adaptation of Lord of the Rings, a resemblance which is fitting given Speyside’s Shire-like landscape. As distillery manager, he had no discretion over which spirits were selected for Glenmorangie and which were bottled under the Glen Moray brand, but as the head of the distillery, Dodson managed every facet of the whisky production. He did a masterful job of running the distillery for nearly twenty years. "Scotch whisky production is a tradition that continues to breathe economic and cultural life into modern rural communities." In Dodson’s time, running the distillery was more than a blue collar job; it was a way of life. While managing Glen Moray, he lived in the manager’s cottage on-site with his wife and their boys, who would build forts with their playmates in the woods on the grounds. This sense of community extended beyond the confines of the distillery. Dodson was closely connected with other distillery managers in the region. Although the various whisky brands are competitors, the people who work in the industries that support Scotch production are a community of collaborators. The managers could count on each other for a short term loan of malt when shipments ran late. Dodson recalled that his employees played soccer and curling matches against teams from other distilleries, and during the matches, managers would freely share whisky samples drawn from the casks in their warehouses. Graham Coull took the reins of the distillery after Dodson retired in 2005. The cherubic Coull grew up just outside Elgin, five miles from the Glen Moray Distillery. After earning a chemistry degree, he began his distilling career at a local brewery. Before becoming Glen Moray’s master distiller, Coull managed production for William Grant & Sons at the large Glenfiddich Distillery. Like his predecessor, Coull is responsible for the distillery’s day to day operations, but unlike Dodson, he is also responsible for the taste of the bottled spirit and for experimenting with new blends and cask finishes that are to be sold exclusively under the Glen Moray label. Dodson's job kept him exclusively tied to the distillery. Coull remains in charge of distillery operations, but as Master Distiller, he travels the world to market Glen Moray’s spirits. Coull is genuinely modest and credits the previous distillery managers for their faithful whisky production, the stock of which he draws upon for his innovations. Glen Moray’s Master Distiller Graham Coull stands in front of malt bins, which hold malted barley and date back to 1963. A stellar example of this innovation is the Glen Moray Mastery, a limited release 120th anniversary blend of five whiskies, the oldest of which was casked in the late 1970s during the tenure of Dodson‘s predecessor. The Mastery is a single malt blend of five Glen Moray vintages that represent the work of Glen Moray’s three most recent distillery managers, with a wonderfully rich and complex flavor profile. Coull had plenty of stock to choose from when crafting the Mastery since one hundred thousand casks fill the distillery warehouses. To narrow his choice of whiskeys to include in the Mastery, Coull decided he wanted to capture what makes Glen Moray unique. Glen Moray distillate was among the first Scotch whiskeys to be finished in wine casks. The earliest experiments were finishing the whisky in Madeira casks, which come from the Madeira Islands off the African coast. As an ode to this experimentation, much of the stock used in the Mastery was finished in Madeira casks for a time, which lends the final product tasting notes of raisin, chocolate, and fortified wine. This is a distinct departure from the typical Speyside scotch character, which tends to be sweet and straightforward. 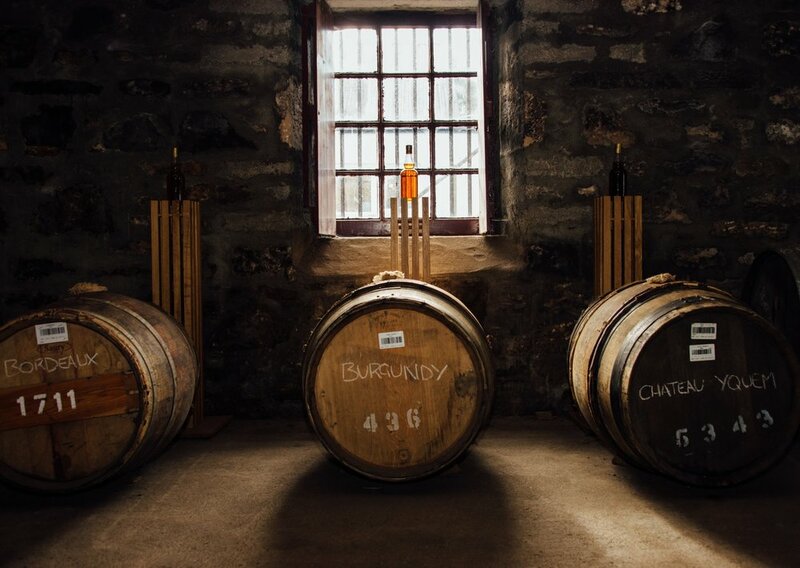 The changes that have happened under Coull’s leadership at Glen Moray partially reflect how Scotch whisky is increasingly marketed and perceived by consumers. Blended whiskies are crafted from spirits that may be distilled from any grain and aged at a variety of distilleries. Single malts, by contrast, come from a single distillery’s malt whisky stock. While blended expressions continue to represent more than 90% of worldwide Scotch sales by volume, single malt whisky commands a disproportionately high percentage of sales because consumers are willing to pay more for them. The value of of single malt Scotch relates to the way that spirits companies market their Scotch whisky brands. Brands readily craft legends and lore from their histories, and distilleries are a permanent physical representation of these histories. Single malt whisky becomes the literal flavor of this lore. Above: From Glen Moray's bottle archives, a vintage single malt bottled in the 1970s sits atop ledgers that serve as a working history of the distillery. Below: Drams of Glen Moray's current single malt expressions. Scotch whisky production is a tradition that continues to breathe economic and cultural life into modern rural communities. The human aspects of this industry came into sharp focus during my last night in Elgin when the distillery hosted a dinner in honor of Glen Moray’s 120th. The banquet was filled with local dignitaries and representatives from the Scotch whisky industry. While the dinner was traditional, it was far from formal. In fact, it felt like the German Russian family celebrations that I remember from my childhood, with obvious cultural differences. We danced traditional Scottish reels to bagpipe and fiddle. Many of the men sported kilt and sporran, and the meal’s first course was haggis, a revered savory pudding made from sweet meats mixed with grains. Traditions aside, what made the celebration most resemble the family gatherings of my youth was the warmth and familiarity between the people in attendance. These were people whose families had lived, worked, and played together for generations. Far from being provincial, however, the people involved in Scotch production have embraced the global stature of their industry while maintaining their local ties. No one is perhaps a better example of this than Richard Forsyth, Jr., whom I met during the dinner celebration. 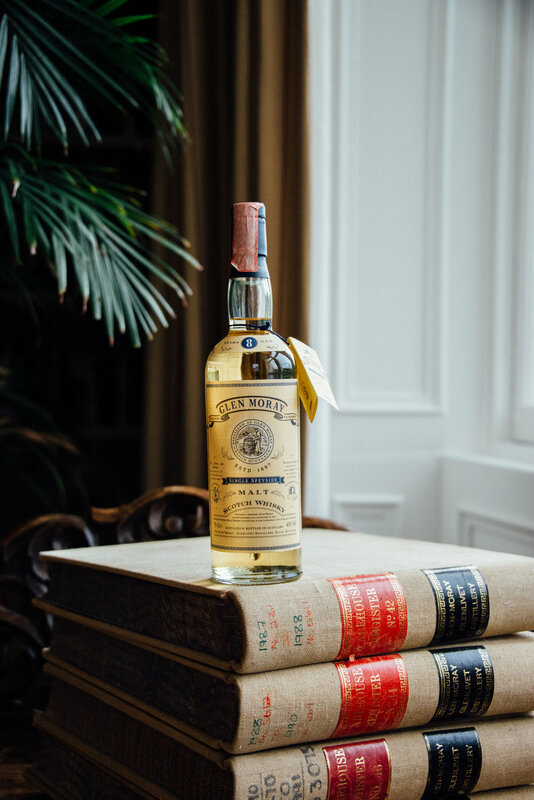 Forsyth is unassuming, which belies his role as Managing Director of his family’s firm, Forsyths Ltd. Alexander Forsyth, his great grandfather, began work as a Speyside coppersmith in the 1890s. The family business built and repaired copper pot stills for the next 100 years. In the late twentieth century the company began to diversify, and although copper fabrication is now a small part of the business, the firm maintains close ties with the whisky industry. Forsyth’s has reportedly manufactured or maintained half of the copper pot stills in Scotland. Forsyth himself is an engineer with international experience. After living and working in Los Angeles for several years, he returned home to take over the family business. Forsyth’s story is one of many I heard during my visit about the multi-generational ties that families have to the whisky industry in Speyside. The deep roots that the people of Speyside have in both the land and the industry was striking to my American sensibilities. In spite of its vast scale and dramatic beauty, the American landscape is one that people have tended to move across rather than to put down roots in. Few of the communities that have managed to put down roots in American soil have endured. Speyside, however, is a land that has given rise to a people and an industry whose roots go deep, and whose canopy spreads wide.